Potato was the third episode of Blackadder II and features an epic voyage of discovery, a remarkable historical figure and a unique, if somewhat eccentric, captain. In this podcast Gerry and Iain take a look at fine wine from distant shores and other such riches. Only two actors besides the series regulars appeared in this episode. Simon Jones portrayed the returning hero, Sir Walter Raleigh, while Captain Redbeard Rum was memorably brought to life by the fourth Doctor, Tom Baker. Blackadder II was written by Ben Elton and Richard Curtis and all six episodes were directed by Mandie Fletcher. John Lloyd produced the series and Howard Goodall was responsible for the music. Potato was released in 1986. It is 30 minutes long and originally aired on the BBC. 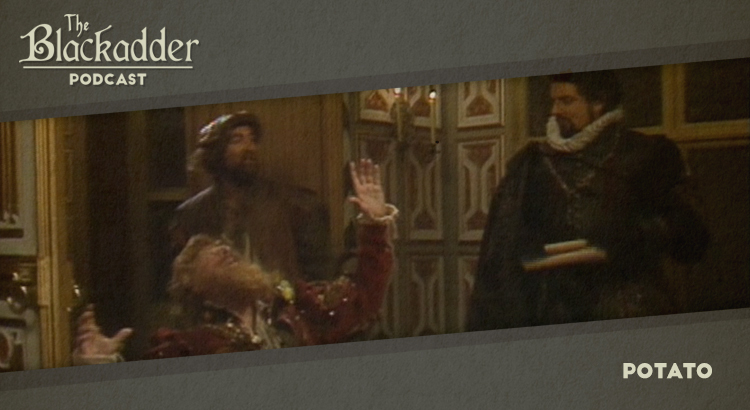 Blackadder II can be viewed on Netflix in the UK and Ireland and a remastered set of the whole series is available on DVD around the world (Region 1) (Region 2).